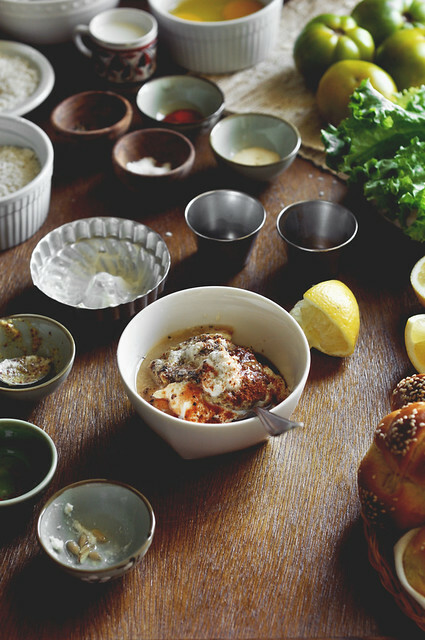 Last week I decided to torment you guys by putting up a recipe for Mini Challah Rolls—have you checked it out already?—with a promise to post a delicious slider recipe the following week. Well, guess what?! 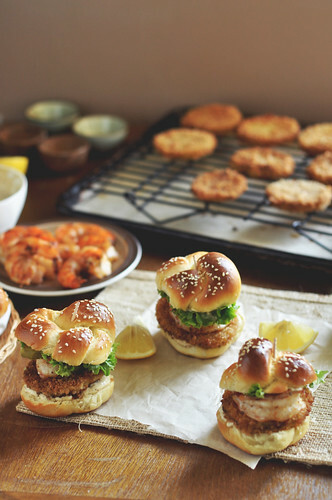 It’s the following week already, and here I am with the promised delicious slider recipe. 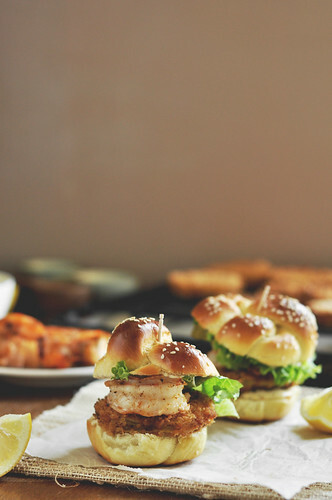 And just in case you’ve been living under a rock or something, and aren’t familiar with the fact that I’ve had some great sliders on this blog before, I’ll refresh your memory. We’re going to start this recipe by making a sauce for the sliders. No one likes a dry slider, burger or sandwich (at least I hope no one does). So we definitely need a sauce to go on our buns. Something that compliments all of the flavors we got going on here. Every time I’ve ordered fried green tomatoes at a restaurant, it’s always been served with a remoulade sauce. That’s what we’re going to be making. 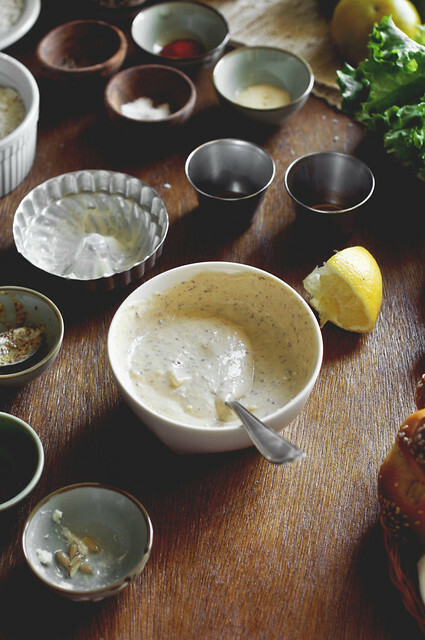 It works perfectly because it just so happens that seafood and remoulade sauce are the best of friends. 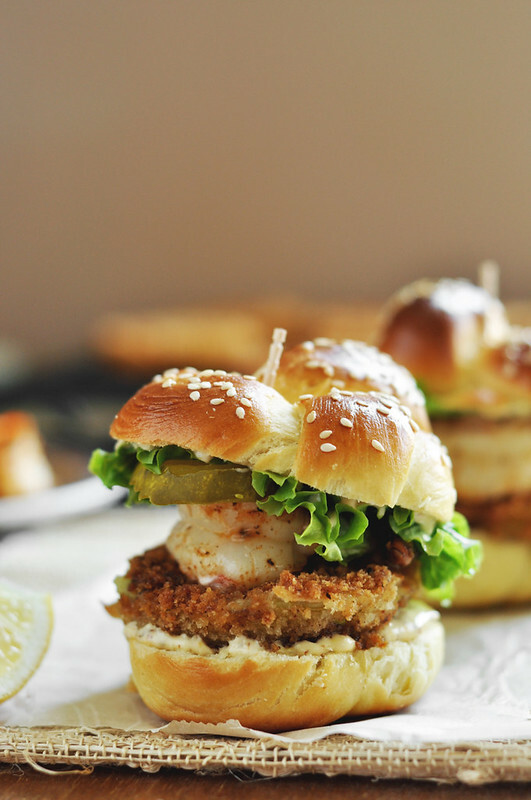 Since these sliders have grilled shrimp in them, well, the remoulade is the perfect sauce to make. 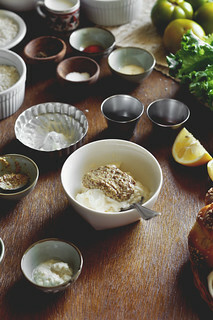 We start by throwing mayo, creole mustard and horseradish in a small bowl. Throw in the rest of the ingredients into the bowl: Worcestershire sauce, tabasco (hot sauce), salt, pepper, cayenne, and lemon juice. 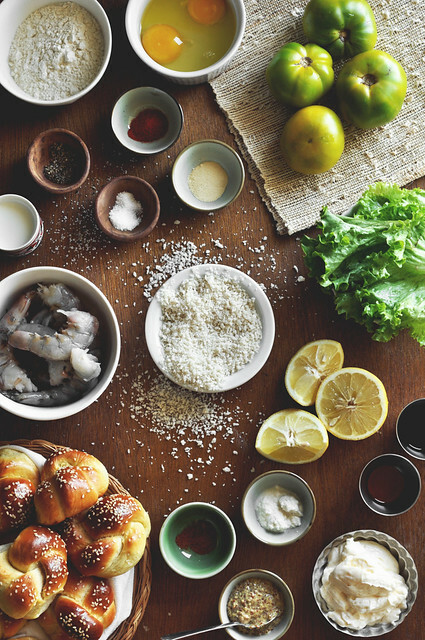 Stir everything together until evenly combined. Give it a taste and adjust the seasonings accordingly. If you want some more heat, add a bit more of the hot sauce. If you don’t think it’s tangy enough, add some more fresh lemon juice. If it needs more salt or pepper, by all means, add the salt and pepper! Just get the sauce to the point where you’re like, “WOW! That’s the best sauce ever!” Then you’ll be good to go. Let’s turn our attention to the shrimp. I’m using a large shrimp—like the jumbo kind—that I peeled and deveined myself. It’s cheaper that way. Season it with some oil, salt, pepper, cayenne, and Old Bay Seasoning (that’s a cajun seasoning). Toss to evenly combine, and let it hang out for a few minutes while the grill gets super duper hot. Heat a stove top grill over medium-high heat. You want it to be smoking hot. Grease lightly with oil or cooking spray. Then lay out the shrimp, in an even layer, making sure to not overcrowd the pan. 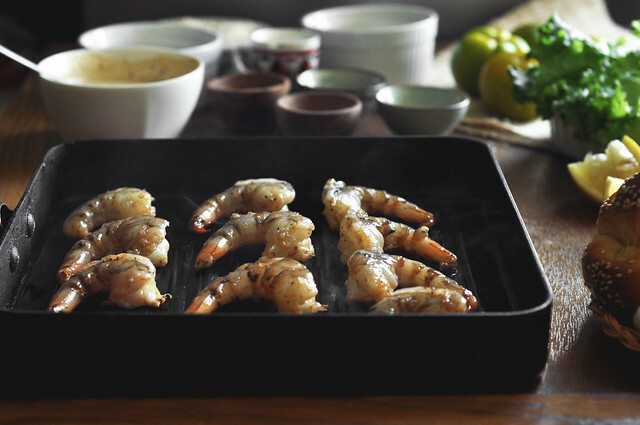 If you need to grill the shrimp in batches, do that! Grill until charred and crispy, about 2 to 4 minutes. Then turn over and cook for another 1 to 2 minutes. 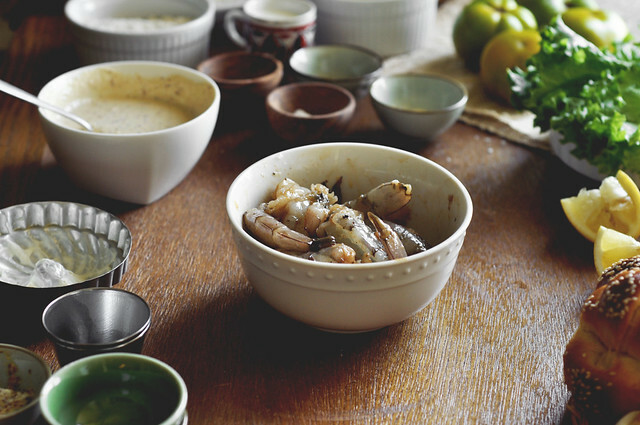 Once the shrimp has cooked, transfer them to a plate or platter, and allow to rest until ready to use. 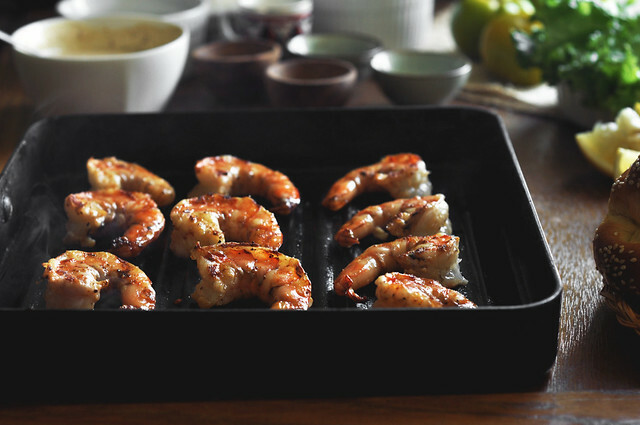 I know it seems hard to tear yourself away from that grilled shrimp. I got you all excited for it and now I’m telling you to put it off to the side. What a crazy world we live in. But we need to get working on the green tomatoes. 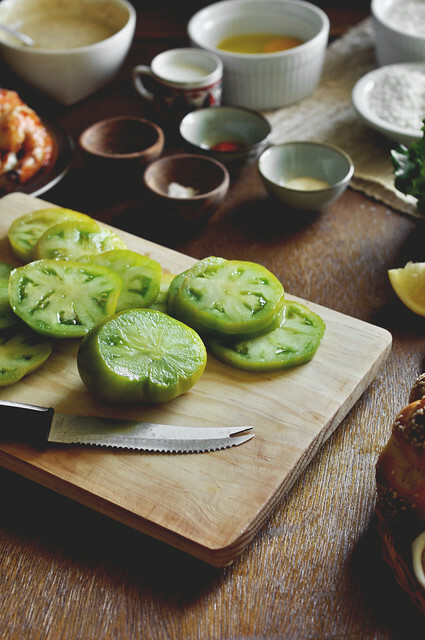 In case you didn’t know, there is such a thing as green tomatoes. Don’t make a face, not everyone knows that. 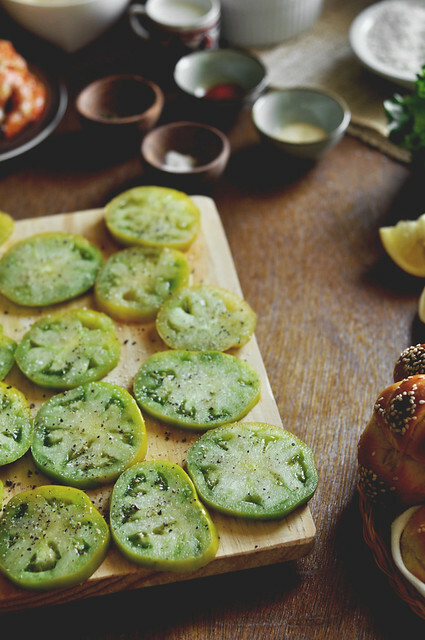 I told a couple people about this recipe and they’re like, “There’s green tomatoes?” They’re usually by the heirloom tomato section in the produce aisle of the supermarket. So anyhow, I digress. Slice the green tomatoes into somewhat thick, but still kinda thin slices. About a quarter of an inch thick. 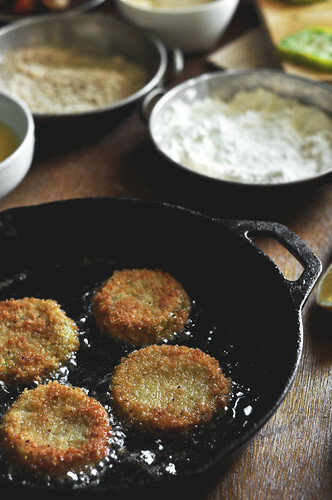 Lay them out on a single layer and season with salt and freshly cracked black pepper, on both sides. It’s always important to season as you go and to season every layer of each dish. That’s how you’ll know that a dish is seasoned properly. And now, for the fun part. 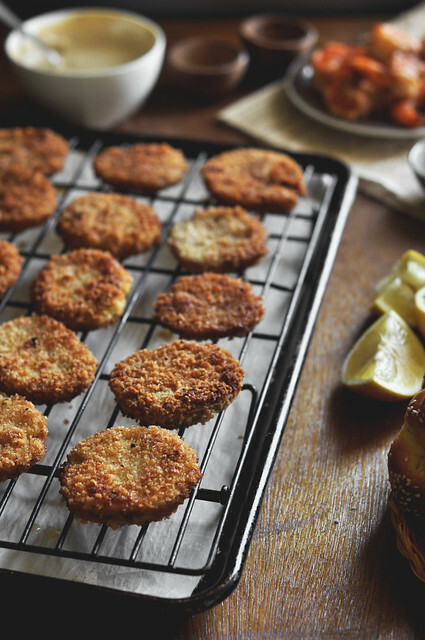 We’re going to dredge and coat these tomato slices in flour and bread crumbs to make them crispy and crunchy. Season the flour with salt, pepper, garlic powder, and cayenne, in a shallow dish. In a separate dish, season the bread crumbs with cayenne and paprika. In a third dish, whisk together the eggs and milk. We’re creating an assembly line. 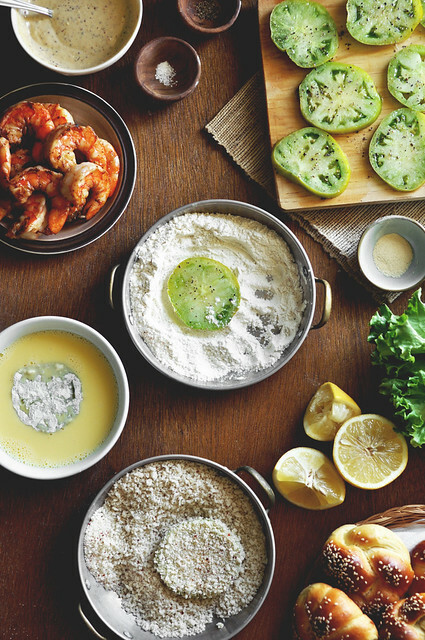 Dredge each tomato slice in the flour first, and shake excess. 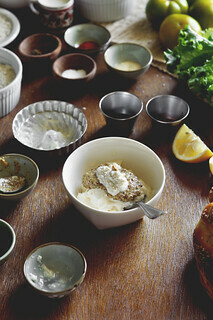 Then dip into the egg wash, and finally into the bread crumbs. Continue this until all of the tomatoes are coated. 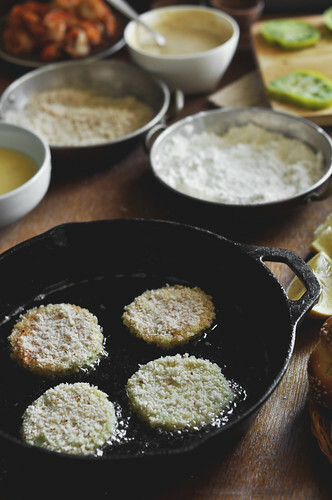 Lay them onto a baking sheet or plate or platter, before frying. Heat a large skillet with the vegetable oil, over medium-high heat. Once hot, carefully add the coated tomato slices and cook for about 2 to 4 minutes or until golden brown. Flip over and cook for another 2 to 3 minutes. Transfer to a wire rack, set over a baking sheet. 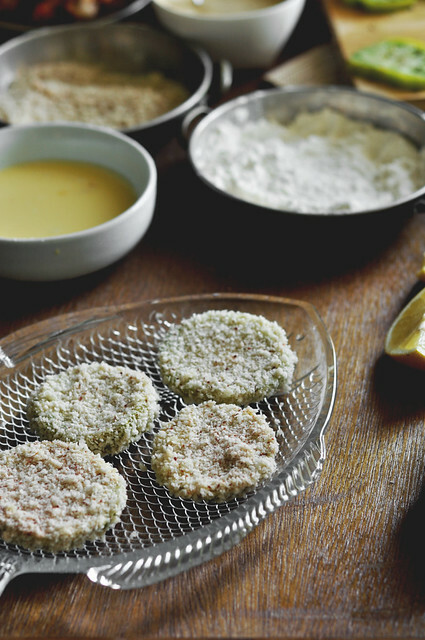 Continue to fry in batches until all of they’re all fried, laying the finished slices on the wire rack. Now that we have all of the components done, we are ready to assemble the sliders. Again, you can use whatever kind of bread you like. Some stores carry actual slider sized buns, but you can also use dinner rolls as well. Or if you want to be too cool for school, y0u can make your own buns, like I did. 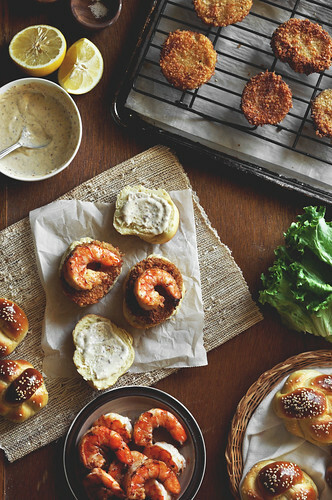 Get the recipe for these Mini Challah Rolls. Or if you prefer biscuits. Or an Everything Slider Bun. 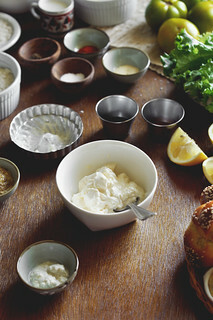 Either way, whatever you decide, slice the buns in half, and then slather with the remoulade sauce we made earlier. 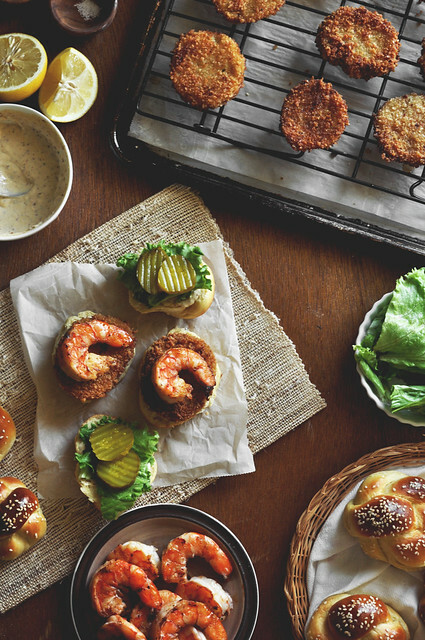 On the bottom part of the bun, lay down a fried green tomato, and top with a grilled shrimp. I think one of each per slider is more than enough. Anything more and you wont be able to pick it up and fit it into your mouth. 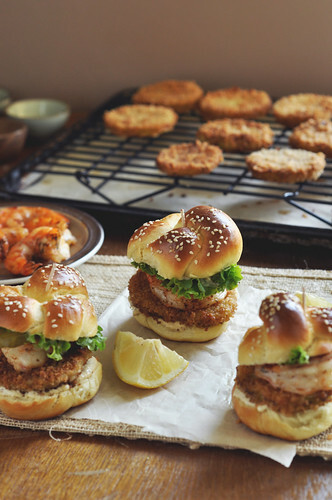 Finish off the sliders with some leafy green lettuce and a few pickle slices. Sandwich the two halves together and stick a long toothpick through each to help hold everything in place. Then stand back and get ready for the best slider you’ll ever eat. Is it weird that I just finished eating like ten of these and my mouth is still watering just looking at these pictures? 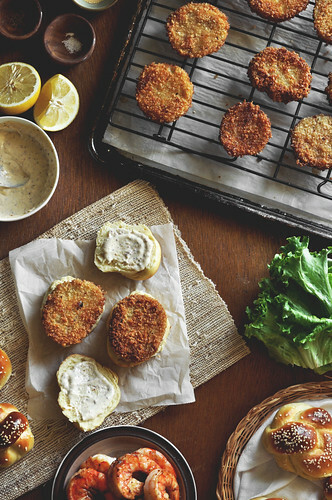 These are a great starter or appetizer to have for a dinner party, or gathering. You can omit the shrimp and have them be completely vegetarian, if you wish. They’re even great for dinner. Serve them alongside a salad or some potato chips (I think a kettle chip would be amazing with these) or make some fries or oven roasted potatoes to go along with them as well. I’m all for recipes that you can make in advance, however, this one doesn’t really work that well for prepping ahead. 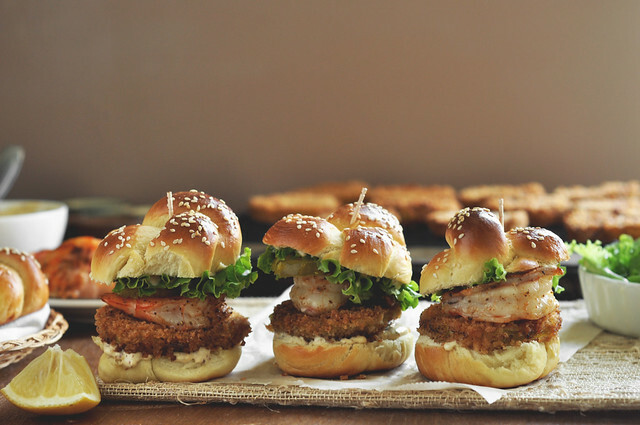 Sure, you can make the rolls in advance, bake them, and keep them in the freezer until ready to make these awesome sliders. Just reheat the buns before assembling. You can also, make the sauce a day in advance, it’ll save you a step on the day of. Other than that, there isn’t anything else you can do early on. The tomatoes are best fried and eaten on the same day. As for the shrimp as well. 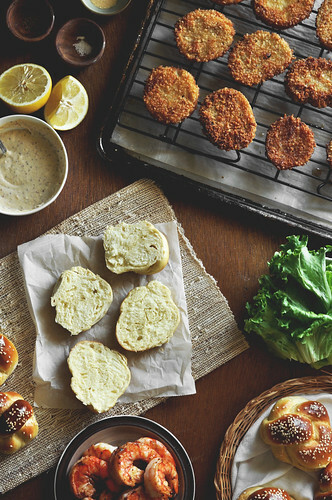 I’m a carnivore to the very core and although I do sometimes enjoy a vegetarian dish here and there, I do have to admit that this recipe makes me not miss chicken, beef or pork (at the moment). 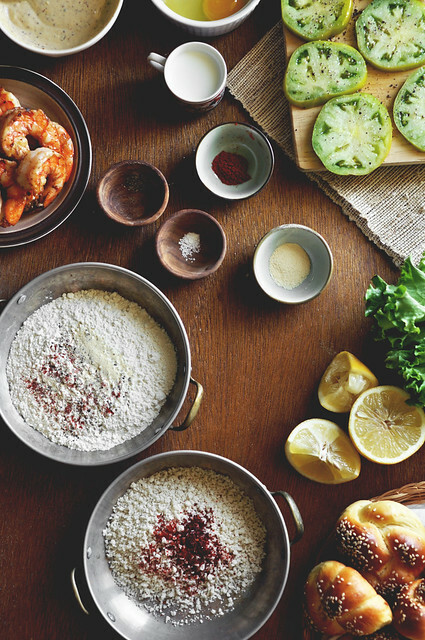 Sure, there’s shrimp involved (can you blame me?) but it’s just shrimp. It’s pretty much vegetarian…as vegetarian as I can get. 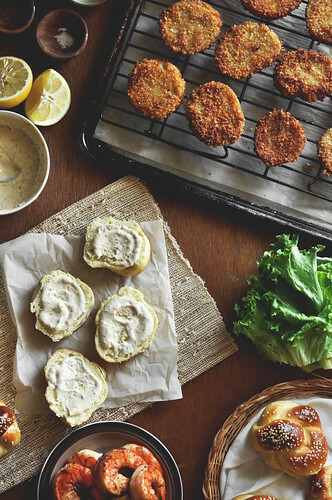 The fried green tomato is a hearty enough slider patty that you don’t realize you’re not eating some kind of meat. But don’t get too excited because the fun ends here. Tomorrow I plan on eating steak…or chicken…or pork…or maybe all three sandwiched together. I kid, that’s not possible. But maybe it is. Who knows, really?! 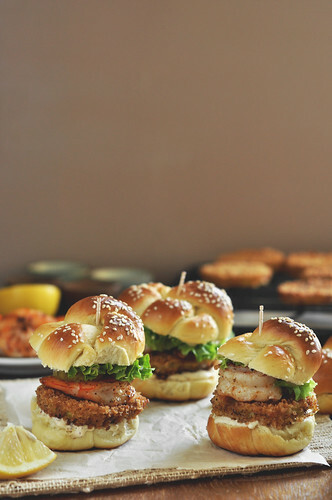 What I do know is that these sliders are the bomb dot com. They’re a one way ticket to Flavortown and you need to jump on board. Enjoy! The perfect summer slider. 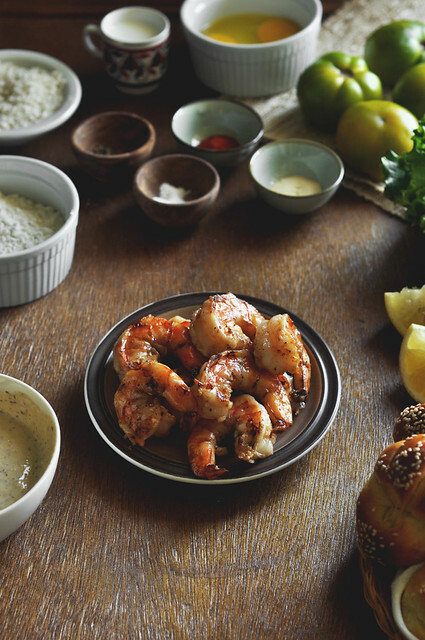 Fried green tomatoes, grilled shrimp, slathered in a delicious creamy remoulade sauce and sandwiched with a soft challah bun! Yum! This looks beyond awesome Jonathan!! Love the photos too, and have a great day! King of Sliders you are!!! These are incredible. Can you just write a sliders cookbook already?! These look amazing! Thank you for creating them and sharing!! I have a quick question for you…I’ve been looking for a baking rack that I could use in the oven (like for as you mentioned reheating or cooking things that should be crispy). Where did you get yours? Or do you have a recommendation? Thanks! I saw this recipe on Pinterest and clicked through to your site. 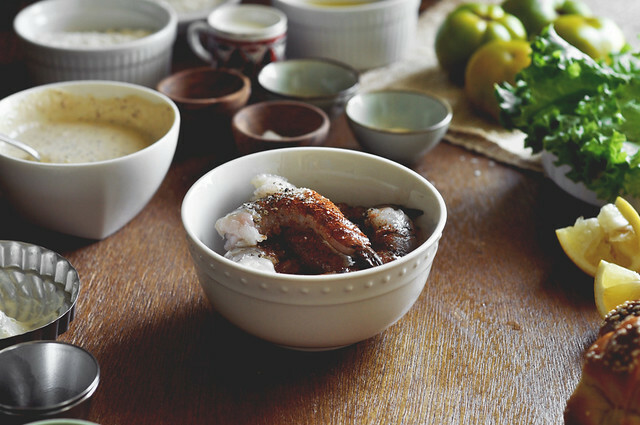 I read the whole post line-by-line – it is a beautiful recipe and I will most definitely make this in some form or the other (mine will contain sriracha, that’s for sure). Love and adore sliders, like you. 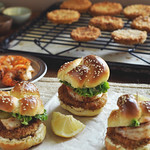 We do sliders in the Pakistani kitchen, too, shall blog it soon. Yours is truly an AMAZING recipe! Love this idea. Pinning this to my Sliders group board. And nice to find your blog. I’m a new subscriber. 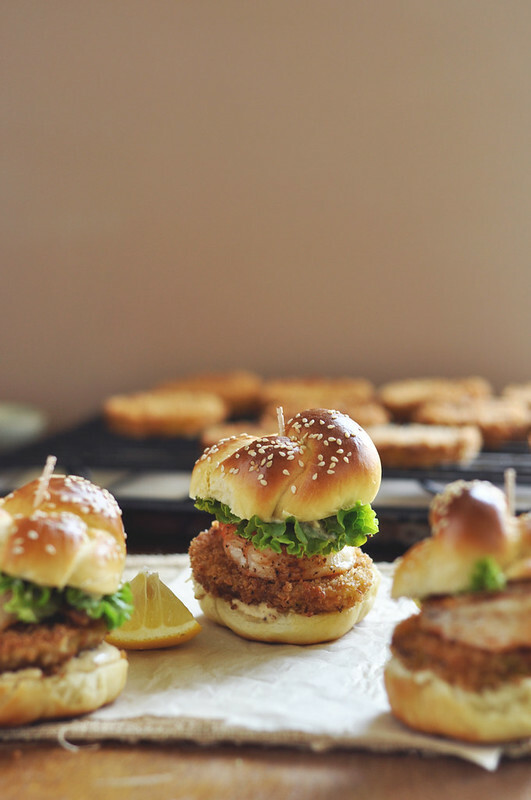 i am OBSESSED with sliders at the moment.. thanks for sharing the recipe, it’s definitely one i have saved to recreate in my kitchen! love your step by step instructions too. love it! mmmm this looks really good! I’ve never tried frying tomatoes that way, sounds like a great idea! looks tasty! where did you get that pan you cooked the shrimp in? Hi Alisa! I got it from Bed Bath and Beyond! Used a coupon too!